Shortly after the Second World War there were numerous attempts to produce a lightweight, handy submachine gun for military usage. Based on an earlier design by Erma the Mauser Arms company began production of their MP-57 in 1957. The weapon featured a metal folding stock which recessed over the top of the weapon. To help control the weapon during full-automatic firing the weapon was equipped with a folding metal hand grip. However the weapon suffered from one major problem, the global arms market was already awash in World War II designs. 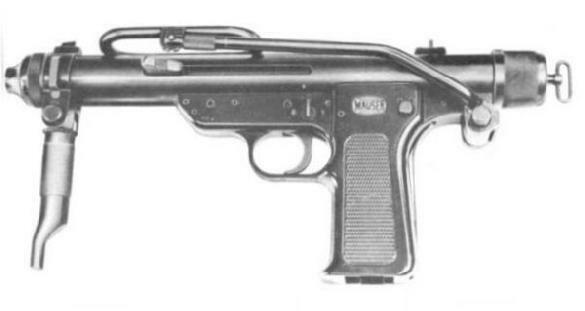 There was no place for newer designs and as such the Mauser MP-57 only went into small scale production and eventually ceased manufacture all together. The MAUSER MP-57 fired the 9x19-Parabellum feeding from a 32-rounds magazine. Its weight was 6,15 Pounds.